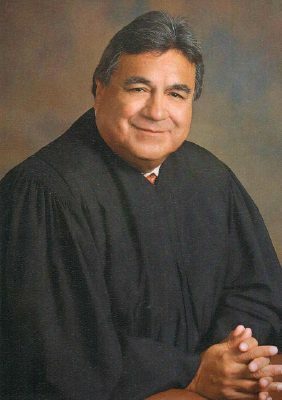 A court granted a motion for a new attorney to represent the state judge facing federal bribery charges in Hidalgo County, according to court records. On Friday, the court granted Rodolfo “Rudy” Delgado’s motion to replace the two local attorneys he retained following his arrest — Adolfo “Al” Alvarez and Fernando G. Mancias — for San Antonio-based Michael W. McCrum. In that filing, prosecutors also requested the court to resolve what they believed was a conflict of interest on the part of Alvarez, who was Delgado’s lead counsel. Alvarez was retained Feb. 2 — the day federal agents arrested Delgado. The charge stems from an FBI investigation into Delgado that began in November 2016 and ran through at least the end of January. The investigation revealed the judge would allegedly accept bribes in exchange for favorable consideration on cases he would oversee in the 93rd state District Court, where Delgado has presided for more than 10 years. A confidential source, who is a licensed attorney, confessed to investigators he or she had a history of bribing Delgado since 2008. Delgado was arrested on an outstanding FBI arrest warrant and amid a sweep of his office at the Hidalgo County Courthouse and his Edinburg home. Several FBI agents were spotted at the scenes assisted by Texas Rangers and deputies with the Hidalgo County Sheriff’s Office. The agents could be seen removing plastic bins from his home, but it is unclear if anything was removed from his office. Delgado, who has been free on a $100,000 bond since his initial appearance in federal court Feb. 5, also requested Friday a motion to travel outside Hidalgo County to San Antonio to meet with McCrum and additional attorneys, the court record states. Delgado, who advised the court he would only be gone for the weekend, also asked and was granted permission to travel to Austin. “… This week will mark the one-year anniversary of his son’s death in Austin, and defendant and his wife want to travel to Austin to visit the place of his death in memory of their son for emotional reasons,” the record states. Last February, the body of former Hidalgo County assistant district attorney Ricco Damian Delgado was found submerged in an Austin creek. Ricco — who resigned from his position at the DA’s office in October 2016 amid a rash of arrests related to driving while under the influence, and possession of air spray cans, or “dusters” — was found submerged in Barton Creek at Zilker Park. He was 32 years old. No date has been set for Delgado’s indictment hearing, but it is expected in early March in a Houston courtroom.